Perhaps his parents should have renamed him “Miracle” after he miraculously survived that vicious crocodile attack at the age of nine? “We were crossing Angwa River to school when it attacked me. It grabbed my leg and was already pulling me into the river and when my brother heard me scream, he turned back and rushed to wrestle it. “I still remember how my brother wrestled the crocodile as I held firmly to the grass. When it finally let me go, it had already destroyed my leg. He pulled me to safety and meanwhile the other pupils we were with had run to the nearby village to call for help. So when the villagers came I was lying helplessly while bleeding profusely. “I was rushed to Mushumbi Clinic and I was referred to a hospital in Harare. As there was no ambulance at the clinic, I remember some organisation volunteered their vehicle to take me to Harare,” recalls Hardlife. “Hardlife was attacked by a crocodile while crossing the river to school and this resulted in him being amputated. 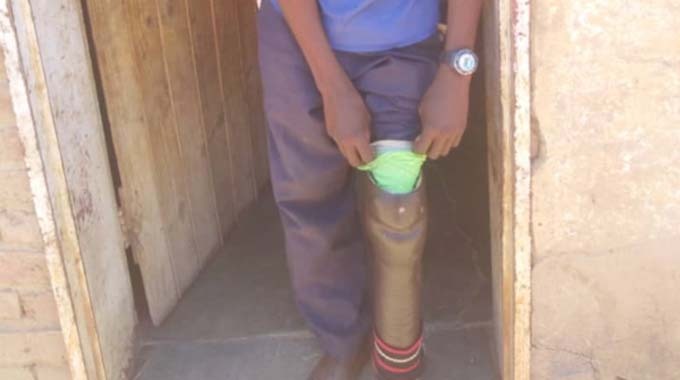 Due to the disability he could no longer walk the long distances to school hence spent years out of school. “When this programme was started, pupils like him were identified and we have 15 children who are being housed at the school where we have improvised to come up with a make shift boarding school to accommodate the pupils who come from different areas in the province and some come as far as Harare because the service is for free. “When the programme was started at this school, we realised that the distances most of these pupils have to travel daily from their homes to school will be an obstacle hence we came up with a make shift boarding school. At the moment we have 15 pupils and we use school funds to cater for their needs such as food and other needs and sometimes we get support but it is not consistent. “We remain determined to keep pupils like Hardlife in school and we call for more support from partners and the Government so that we can keep these children in school. They have a right to education too,” added Madimbu. “I still vividly remember visiting Hardlife in hospital back in 2008 when he was attacked by the crocodile. We even supported in paying part of his medical bills at the hospital and provided his first prosthetic leg after he was amputated. We have been supporting him since then and we intend to get him another prosthetic leg as he has outgrown the one he has. “I remember two days after he got into hospital, another child who had been attacked by a crocodile in the same Angwa River came at Parirenyatwa. The place is a death trap for all especially the pupils who have to cross it daily to reach the nearest school. There have been several calls by the community to have a foot bridge or a school built so that the pupils do not risk lives but that is yet to be done. “I still remember us buying groceries for him and I’m glad he survived and he is back in school and I pray his dreams come true,” she said. “I’m grateful that I got another chance to go back school and I want to be a doctor when I grow up.